This page is dedicated to more frontier/period style edged pieces. 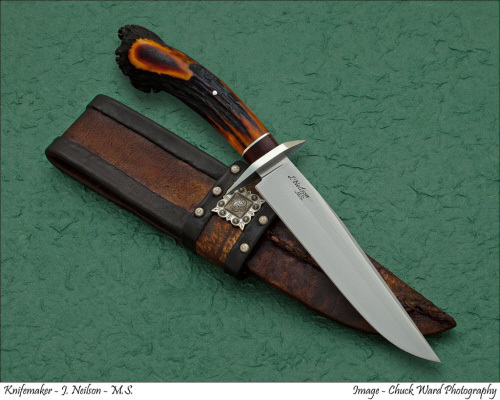 I've always been a great fan of Winkler/Shook sets and with the help of Frontier-style Sheath-maker John Cohea, you'll be seeing some fun and fully functional "old looking" stuff here. Here's a simple and classy Camp piece with an "old world" look. This knife is forged from 5160 high carbon spring steel with forge marked and acid soaked flats as well as my "antiqued" blade finish. The knife also has a file worked thumb rest as well as an open/exposed lanyard hole. The handle scales are beveled/sealed white bone with brass handle bolts and brass "pin trail" accents. This knife is 15 3/8" overall with a 10" cutting edge and comes with a raw hide sheath by John Cohea with lacing and matching brass tacks. Here is a clip-point version of my "Big Spike" Railroad spike knife in a "pattern welded" version, which means splitting the spike 3 ways down the length of the first half of the spike and forge welding in 15N20 steel. 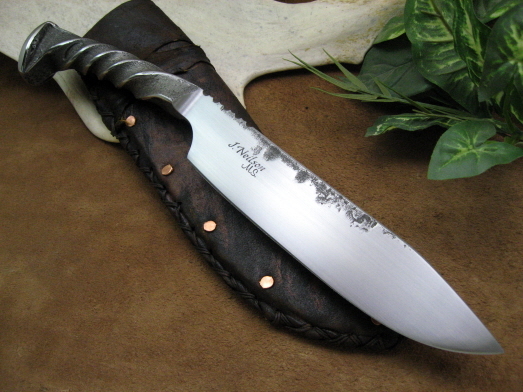 The "plus size" high carbon steel railroad spike is then twisted and forged into a blade. The handle is twisted and acid soaked, leaving a nice forge finish to the low points and then polished head and rises for a nice contrast. The knife is 11" overall length with a 6 1/2" cutting edge. 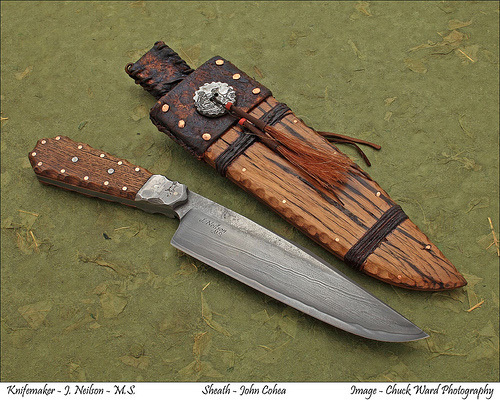 The knife comes with a rawhide period sheath by John Cohea with lace, iron tacks and an exotic skin inlaid belt loop. This piece was inspired by the movie "Legends of the Fall" from 1994. The 8" blade is forged from 1095 high carbon steel with forge-marked and acid soaked flats then given my "antiqued" finish. The handle is a bleached antler "fork" that has been completely dried and then fully sealed. The handle has raw hide wraps around the ricasso and the palm of the handle and is secured by a piened brass pin under the palm wrap. The overall length of this piece is approx. 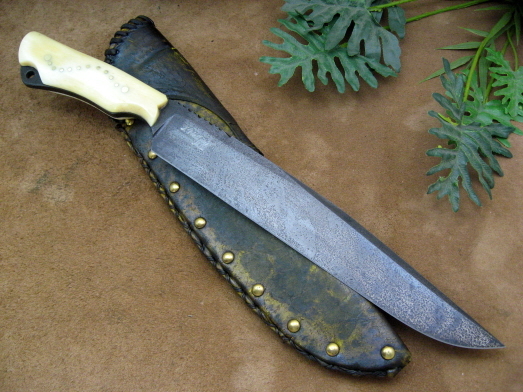 13" and comes with a matching primitive sheath by John Cohea. This piece is a beast, so I named it after one. 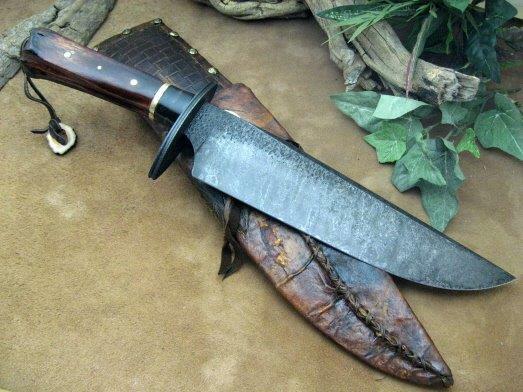 This hunter/camp chopper has a differentially quenched blade of 5160 high carbon spring steel with forge marked and acid soaked flats with my "antiqued" finish on the flat ground bevels. The knife has an oval carbon steel guard with a fullered rim and matching finish. The handle is dyed & sealed Cow bone with a throat of stabilized Buffalo horn and a spacer of hammered/antiqued brass. The handle is secured with matching brass pins. The natural hole in the bone has a leather lanyard cord with an "antler ring" fob The blade is approx. 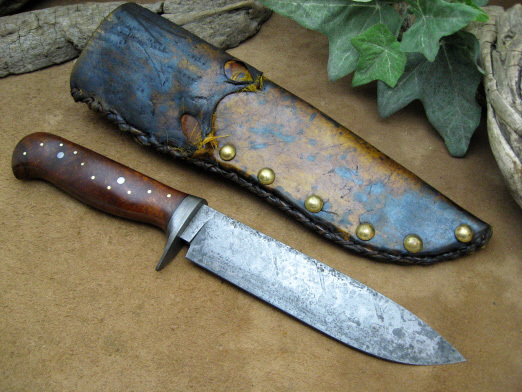 12" with an oal of 18 1/2" and this knife comes with a center seam raw-hide sheath with Concho, exotic skin inlays, brass studs, etch by John Cohea. This is a new version of my "Big Old" Bowie. This full-tang knife is, again, a multi-quenched blade forged from W2 high carbon steel with a hand-rubbed finish and is etched to reveal multiple quench lines. The thumb rest and entire tang have been file worked. This knife has bolsters of wrought iron etched and secured with carbon steel pins. The handle scales are Mammoth Ivory with black tang liners and secured with satin finished stainless steel handle bolts. The handle also has an exposed pommel/lanyard hole. The piece is finished off with a leather cord and ivory fob. The overall length of this knife is 13 1/2" and has a "honey-combed" tang to lighten the handle weight and keep the knife balanced. 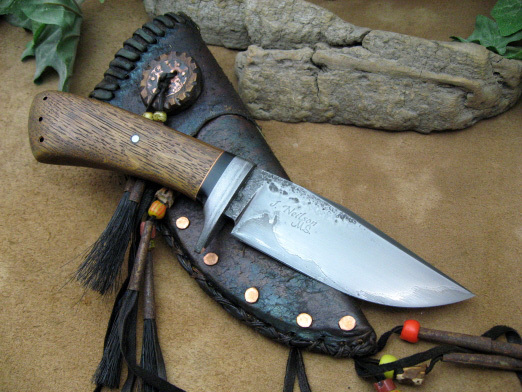 This Bowie is shown here with a fancy raw-hide "cross-draw" sheath with copper accents, trade beads, cones with horse hair and a copper-faced belt loop by John Cohea. 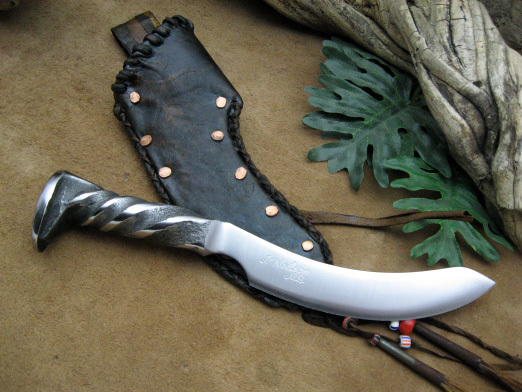 This hidden tang belt knife is done in a spear-point style and forged from "Frontier" damascus (multiple steels and patterns done in a canister weld with 1084 powder). The blade has a 4 1/4" cutting edge. The knife has a 350 layer plus laminate damascus "button" guard. The handle is made of Desert Ironwood Burl up front and Oosic on the back with the natural end in tact. The pieces are divided by a stainless steel spacer and secured with two stainless steel pins. The overall length is 9 1/2" and the piece comes with a rawhide sheath with and Ivory Concho, rattlesnake belt loop, trade beads, horsehair with cones, etch by John Cohea. This Bowie was built as a benefit piece for the March of Dimes. 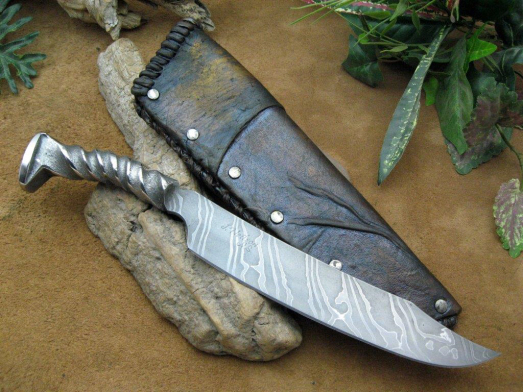 The damascus blade is 11" and done in a canister weld with high carbon powder steel and contrasting "marching arrows" in the steel and forge marked/acid soaked flats. The guard is wrought iron with matching "arrow" tips. The handle is a Sambar Stag crown with a throat of high contrast laminate damascus with a black spacer and secured with a piened/etched carbon steel pin. 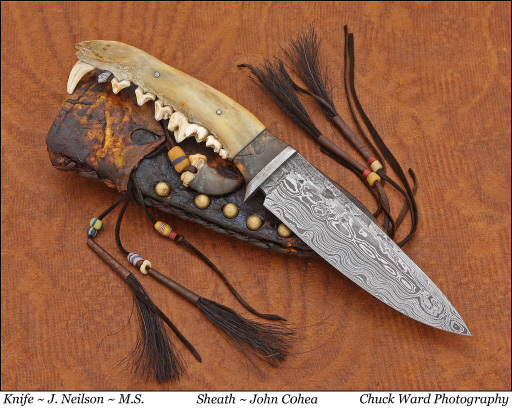 The knife comes with a rawhide sheath with antler and rattlesnake accents by John Cohea. This "plus size" piece is forged from an oversized, high carbon steel Railroad Spike. The handle is twisted and acid soaked, leaving a nice forge finish to the low points and head along with a nice contrast to the satin finished rises. The blade itself has a hand-rubbed finish. The knife is 11 1/4" overall length with a 5 3/4" cutting edge. 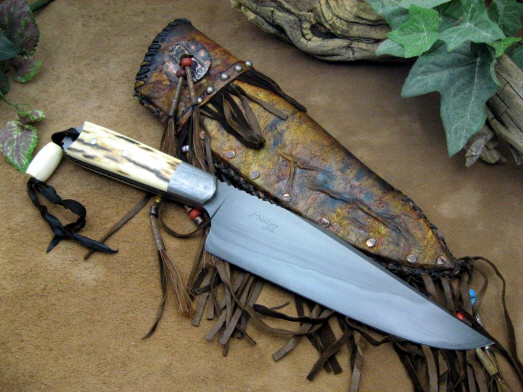 The knife comes with a rawhide period sheath by John Cohea with lace, copper tacks and an exotic skin belt loop. This period -style Bowie has an 7 3/4" blade forged from 52100 high carbon steel with a hand-rubbed finish. The guard, spacer and piened pin are all polished nickle-silver. The throat is Desert Ironwood Burl and the handle is an A-grade Amber Sambar Stag crown. 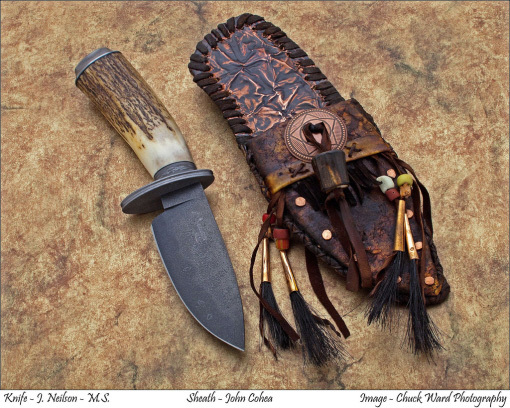 The overall length of this piece is 14" and it comes with a "center seam" Mexican loop sheath in rawhide with deerskin rolls and decorative concho/spots by John Cohea. This Coffin Bowie knife has a multi-quenched blade of W2 high carbon steel with a hand-rubbed finish, forge marked flats and etched to reveal multiple quench lines. The handle has etched wrought iron bolsters with etched stainless steel pins. The handle scales are "weathered" Barn Oak with copper liners, framed with copper pins and secured with "worked" and etched stainless steel handle bolts. The Oak scales and wrought iron bolsters have "scalloped" corners. The tang is fully etched as well. The overall length of this piece is 13 1/4" with a 7 1/2"" cutting edge. The John Cohea sheath matches the knife handle material, with horse-hair and beads in addition to the Barn Oak, wrought iron, copper, etc. This drop-point hunter has a 4 5/8" edge-quenched blade forged from W1 high carbon steel with an "antiqued" finish and visible hamon. The fullered oval guard is "wagon wheel" wrought iron and the throat of the handle is canister damascus. The handle is Sambar Stag with black spacers and is finished off with a matching beveled wrought iron pommel. The overall length of this piece is 9 1/2" and comes with a John Cohea rawhide sheath done with copper overlay, trade beads, concho, horse hair, etc. This is my "Old Bones" full-tang belt knife. The knife is approx. 7" overall with a 3 1/4" cutting edge of W1 steel with an "antiqued" finish on the blade and tang. The handle scales are lightly aged Cow bone with a brass pin and lanyard liner. The handle also has copper liners and decorative copper pins. The rawhide/period sheath by John Cohea matches the knife in bone and copper as well as the additional accents of beads, horse-hair, etc. Here is one of my "Baby Bowies" with a frontier kick to it. This hidden tang knife has a 4 1/8" blade forged from mild 1018 steel with a 1095 high carbon core in a san mai style. The blade has an acid soaked, forge-marked finish and has been etched to bring out the core contrast. The guard is "wagon wheel" wrought iron. The handle is "Weathered" Barn Oak with a throat of stabilized Buffalo horn with a copper spacer and copper accents on the pommel-end of the handle. Overall length of this knife is 8 3/4". The handle is completed with an etched carbon steel pin. The rawhide sheath by John Cohea is a treat itself with matching copper/Barn Oak accents, horse hair/trade beads & a copper accented belt loop. 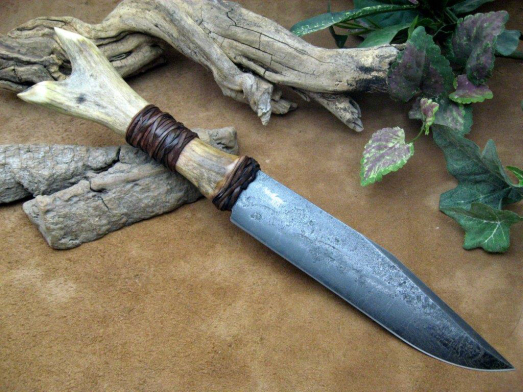 This Spear-point Hunter has a 6 1/2" edge-quenched blade forged from W1 high carbon steel with acid-washed, forge-marked flats and an "aged" finish. The guard is "jail-bar" wrought iron. The contoured handle is A-grade Desert Ironwood with a black spacer, etched/high carbon steel set pins and decorative brass pins. The overall length of this piece is 11 3/4" and comes with a simple raw-hide pouch sheath with brass tacks and a belt loop by John Cohea. This Clip-point Hunter has a 5 1/2" edge-quenched blade forged from W1 high carbon steel with acid-washed, forge-marked flats and an etched hamon. The guard and spacer are "wagon wheel" wrought iron. The coffin-style handle is A-grade Curly Maple with a fullered Bone spacer, etched/high carbon steel set pins and decorative copper pins. This knife has an overall length of 10 1/2" and comes with a fancy raw-hide "cross-draw" sheath with copper accents, trade beads, horse hair cones and a snake skin belt loop by John Cohea. 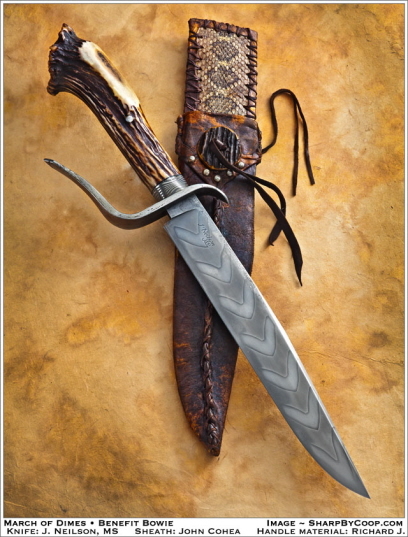 This knife has a spear-point blade of "random-cut" 5 1/8" long damascus with forge-marked and etched flats. The guard is etched wrought iron. The handle is a Coyote jaw-bone with a throat spacer or stabilized/worked California Buckeye Burl wood and black spacers. The handle is finished off with hammered stainless steel pins and a damascus tooth to take the space of a missing one in the jaw. 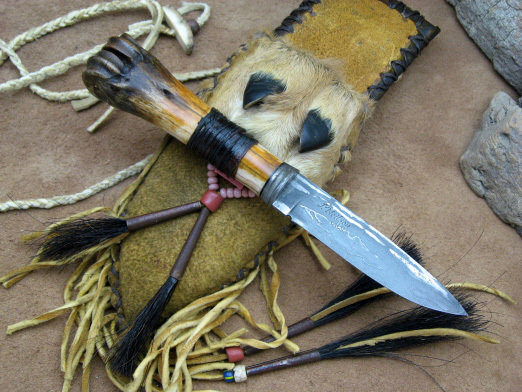 The overall length of this knife is 10 3/16" and it comes with a raw-hide period sheath with Horse-hair, trade beads and Bear & Coyote claws done by John Cohea. This full-tang integral knife is forged from 5/8" 1095 high carbon steel round bar. The blade is edge-quenched and all exposed steel has my "antiqued" finish. The handle scales are stabilized Curly Maple done in a "palm swell" style with thin black liners and stainless steel handle bolts. The knife is 9 3/16" overall length with a 4" cutting edge. 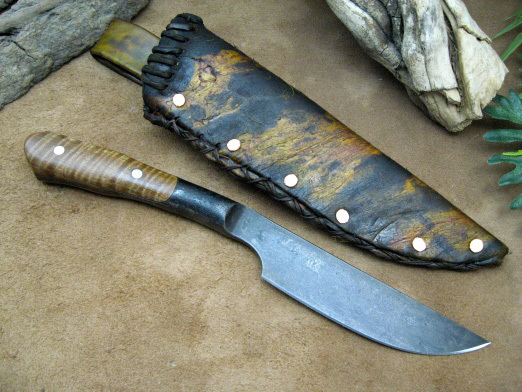 The knife comes with a basic raw-hide pouch sheath with brass nails and a belt loop by John Cohea. This sweeping skinner is forged from a high carbon steel Railroad Spike. The handle is twisted and acid soaked, leaving a nice forge finish to contrast the highly polished rises and spike head. The blade itself has a satin finish. The knife is 8 1/4" overall length with a 4 1/4" cutting edge. 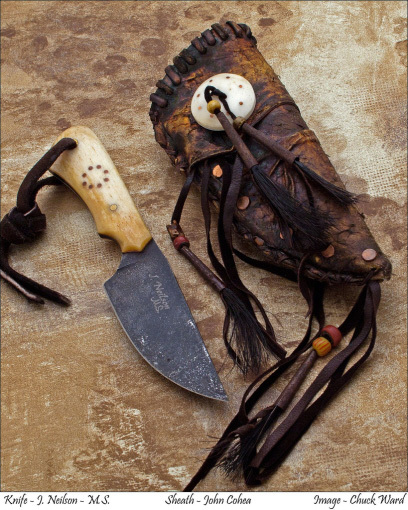 The knife comes with a Rawhide- period sheath by John Cohea with fringe, beads & cones, copper spots and a belt loop. This small Belt/Neck Knife has a 3 3/8" blade forged from "Chainsaw" canister damascus with rough forged flats. The guard is "wagon wheel" wrought iron with file work accents and a black spacer behind. 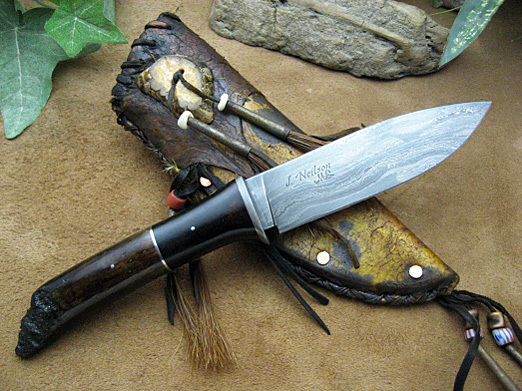 The handle itself is stabilized Deer leg-bone with a raw-hide grip-wrap in the center. The overall length of this knife is 7 1/4". 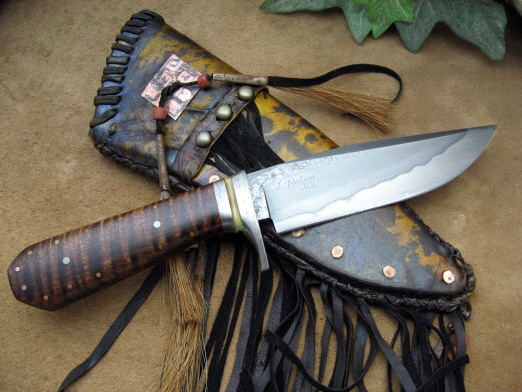 The sheath is made from vegetable-tanned leather, covered in rawhide on the back, and smoked brain-tanned buckskin for the front panels and fringe. The front flap is hair on deer leg rawhide with the dew claws attached, and the belt loop is also hair on deer leg rawhide. The sheath is further accented with horse-hair & trade beads. The removable neck lanyard is also brain-tanned buckskin. © 2013 James Neilson. All rights reserved.